My mom makes the best homemade pudding in the world. She really does, just ask Gareth, my 11 year old, or my kid sister, for that matter. We all love Gramgram’s pudding. Try as I might, I’ve never been able to replicate her recipe, which is a list of ingredients, but no amounts. She just has that 6th sense that some cooks have which allows her to just know how much of this and how much of that for something to turn out perfect. I can manage that occasionally, but apparently not with pudding. In an effort to quell my Vanilla Pudding demon, I offer my own recipe, much tried and finally mastered. Mom’s is still better, but this is pretty darn good. 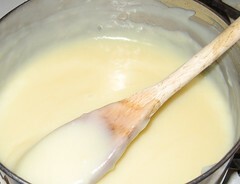 Mix flour, sugar and butter together in a medium saucepan. In a separate bowl, beat egg and add milk. Stir into dry ingredients. Cook on low heat 15-20 minutes until the mixture thickens, stirring constantly to avoid scorching. Remove from heat and add vanilla. Allow to cool at least 10 minutes before eating. Serve warm or cold. Refrigerate any leftovers (leftovers, yeah right!). Serves 4-6, depending on how bad your Vanilla Demon is! This entry was posted in recipe on September 9, 2009 by Jennifer Ofenstein. Your recipe is exactly like my mother’s’ is. It is so good. I make it alot. I slice bananas in my bowl of it and sometimes eat vanilla wafers along with it. I make mine in a double boiler. If I didn’t, I’d sure as burn it in a regular pan, haha. I’m so grateful that you shared this recipe! It is amazing and will be even better as a component of the banana pudding I’m making for my great great aunt! God Bless you! It is my great pleasure to share!